Tag: Jose B. Laurel Jr.
Salvador H. Laurel wrote intermittent diary entries for June 1985, August 1985, September 1985, October 1985, November 1985, and December 1985. 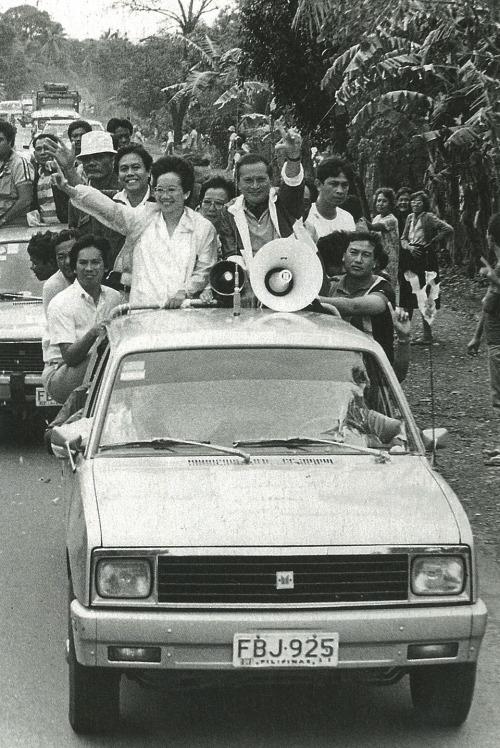 They trace the initial vigor, then collapse, of his campaign for the presidency, and the negotiations for his sliding down to be the candidate for the vice-presidency in what emerged as the Aquino-Laurel ticket. It is well to remember that the unity she forged was not among dependent and undistinguished clones, like the KBL that Marcos holds in his hand. Doy Laurel, Pepito Laurel, Tañada, Mitra, Pimentel, Adaza, Diokno, Salonga and the handful of others who kept the democratic faith, each in his own fashion, through the long years of martial law, are powerful political leaders in their own right. Each has kept or developed, by sagacity and guts, a wide personal following. Not one thinks himself subordinate to another in what he has contributed to keep alive the democratic faith. 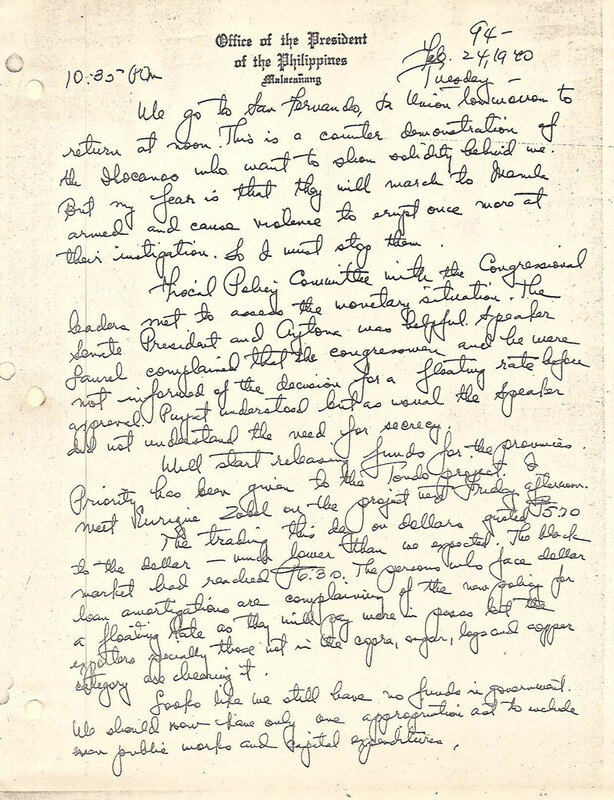 As far as Doy is concerned, his compromises had enabled him to kept at least one portion, Batangas, of a misguided country as a territorial example of viable opposition. An example to keep alive the hope that the rest of the country could follow suit and become free in time. We have forgotten how much strength and hope we derived from the stories of Batangueños guarding the ballot boxes with their lives and Doy’s people keeping, at gunpoint, the Administration’s flying—or was it sailing?—voters from disembarking from the barges in which they had been ferried by the Administration. This is the language Marcos understands, the Laurels seemed to be saying, and we speak it. We have forgotten the sage advice of Pepito Laurel which stopped the endless discussion about how to welcome Ninoy. Every arrangement was objected to because, someone would remark, Marcos can foil that plan by doing this or that. Pepito Laurel said, “Huwag mo nang problemahin ang problema ni Marcos. His problem is how to stop us from giving Ninoy the reception he deserves. Our problem is to give Ninoy that reception. Too much talk going on here!” that broke the paralysis of the meeting. This is the caliber of men who were approached with a project of unification that entailed the suspension, perhaps forever, of their own ambitions. Cory would be the presidential candidate, and Doy who had spent substance and energy to create ex nihilo a political organization to challenge the Marcos machine must subordinate himself as her running mate. In exchange, the chieftains would get nothing but more work, worse sacrifices and greater perils. Certainly, no promises. After two attempts, she emerged, largely through her own persuasive power and in spite of some stupid interference, as the presidential candidate of the Opposition, with Doy as her running mate. She had not yielded an inch of her position that all who would join the campaign must do so for no other consideration than the distinction of being in the forefront of the struggle. This should be enough. She had exercised the power of her disdain. There is a gap in the diary until it resumes with his entry for February 13-17,1986, in which Doy Laurel mentions discussions with foreign diplomats. Then the diary trails off until the EDSA Revolution begins. It is interesting to situate his entries with the chronology available. Compare Laurel’s February 22, 1986 entry with the Day One: February 22 chronology, and his February 23, 1986 entry with the Day Two: February 23, chronology, and his February 24, 1986 entry with the Day Three: February 24 chronology, and his February 25, 1986 entry with the Day Four: February 25 chronology. The chronology of the Flight of the Marcoses, contrasts with Laurel’s diary entries for February 26, 1986 and February 27, 1986. For more, see my Storify story, EDSA: Memories and Meanings, Timelines and Discussions. The end result would be a bitter parting of ways; see What’s with Doy? October 3, 1987. Since the other side of the coin involves Ferdinand E. Marcos, see also my Storify story, Remembering Marcos. January 20, 1970 Malacañang Palace I still write this in Veterans Memorial Hosp. at 8:00 AM. Meldy is coming home to the Palace at noon before lunch. We have stopped the regular stipends to the columnists and newspapermen. This was started by Pres. Magsaysay in 1954. But we have to stop this corruption. This may be the cause of the harsh and even vicious attitude of the newspapers. I am still trying to ferret out the TV and radio commentators who are being bought. This has to be stopped too. The Commissioner of Civil Service, Abelardo Subido, has been found guilty in the investigation of his actuations in entering into contracts with himself. I have requested him to resign. We have to set the example in the higher echelons of government. For undoubtedly there is still petty graft in the lower ranks – the export office is one, the BIR and the Customs. This must be eradicated and soon. Malacañang 11:55 PM Settled the Speakership problem this morning by calling Ex Speaker Villareal, then Speaker Laurel to Maharlika. Villareal graciously withdrew but his supporters swear that if Laurel does not remain loyal to me, they will topple him. Met the congressmen who all wanted releases and appointments. Met Commissioner of Civil Service Abelardo Subido whom I asked to resign for violation of the Anti-Graft Law for signing a contract of lease both as lessor and lessee. Will reorganize the army so that the IInd and IIIrd Military areas will be converted into brigades. More flexible and fitted to the concept of home defense or guerrilla war. Updating the emergency plan to include not only counter-insurgency but even a military attempt at a take over. Have ordered Gen. Raval to prepare a strike force in Camp Crame. Must get the armored units, the air force and naval units organized. Met Sec. Mata, Usec. Melchor, Gen. Yan, Ileto, Raval, Singson and Com. Lomibao. Will meet with Gov. Licaros and Zavkar of the IMF tomorrow. Looks like Zavkar has no power to negotiate but has been instructed to propose devaluation of from 25% to 30% or a multiple rate of exchange. From reports, Zavhkar is of the belief that we will not be able to enforce a multiple rate of exchange. They want a budget surplus in the next six months – which we already have. The truth of the matter is everything – but everything is awaiting at a standstill the results of the consultations with IMF – both government and the private sector cannot move until we know what the BOP strategy is. The newspapers headlined (specially Manila Times) the resignation of Nolan from the Sugar Quota Adm. and Sugar Institute. I have asked him to stay but today I have had to designate Jose Unson the Asst. Sugar Quota Adm. to replace him. This may precipitate a break with the Montelibanos and the Lopezes who, I am sure, are behind it. I hope Ex Sec. Alfredo Montelibano resigns from the RCA so I can appoint Bong Tanco. I write this on the evening of the 16th because last night after the birthday party of Hilda Ysmael, we slept at the Veterans Memorial Hospital so that Meldy may be operated on at 6:00 AM. Manila is talking about the sugar bloc blackmailing me into supporting Laurel for Speaker with the editorials of the Chronicle, the resignation of Nolan, the expected resignation of Montelibano and other signs. this would be an admission of the failure of the monetary policies which I am not ready to do because I approved of them. Although the state of our balance of payments was never revealed to me until June 1969 when it was impossible to do anything as any retrenchment and curtailment of imports and government expenditure would have caused a skyrocketing of process during the political campaign. This would have been a disaster. But as soon as my reelection was assured, I ordered all the necessary steps to be taken like the curtailment of imports and the cutting of government expenditures; all public works releases have been suspended, all casuals terminated, loans and guarantees by the government financing institutions stopped. Prices went up and I had to call the retailers, dealers and importers to maintain the old level of prices. We sent a mission to the U.S. and Europe to obtain new loans and restructure our short-term loans. Ting Roxas bungled the mission. According to Iñing Lopez, Maurice, the President of the German National Bank, Ting Roxas panicked everybody in Germany into believing that the Philippines was in chaos. And they came to the Philippines to see for themselves. To their surprise they discover us still operating as a democracy. Curse upon these theoretical economists! The Villareal group has obtained 67 signatures. Went to see the body of Mayor “Banjo” Laurel who died in a helicopter crash at Pi, Cam. Sur the other night. Their heli went out of gas, landed, refueled with ordinary gasoline, took off at night and crashed. If I do not help Pepito Laurel, he will lose the speakership fight. Have postponed the caucus to Wednesday after Banjo’s funeral. Will visit Iñing Lopez at the Meralco Hosp. tomorrow, at the suggestion of the VP, Nanding & Jose Aldeguer. Received six vessels from the U.S. requested by Amb. Byroade, three LSTs, one tugboat and two LCVPs, this morning at Navy headquarters, then a courtesy call from Mr. Roy Mason, head of the Board of Trade of England, then the City boy and girl officials, Ramon Jacinto and Sen. Aytona on the requirements of ISMI which was one of the big contributors in the last campaign. Am now completing the files including expenses and contributions. Am giving Don Vicente Madrigal an award tomorrow at 10:00 AM.